Take advantage of this rare opportunity to own a home on Rostis Lane in the highly desired Cedar Brook Community located in the heart of East Brainerd. This gorgeous lane of exquisite homes of full brick and stone very rarely go on the market. Minutes to shopping, dining, Heritage Park, and I75, this home is a must see. ***The quality and craftsmanship is second to none. This dream home has gleaming hardwoods and tile on the entire main level as well as the stairway and huge bonus room with wet bar upstairs. 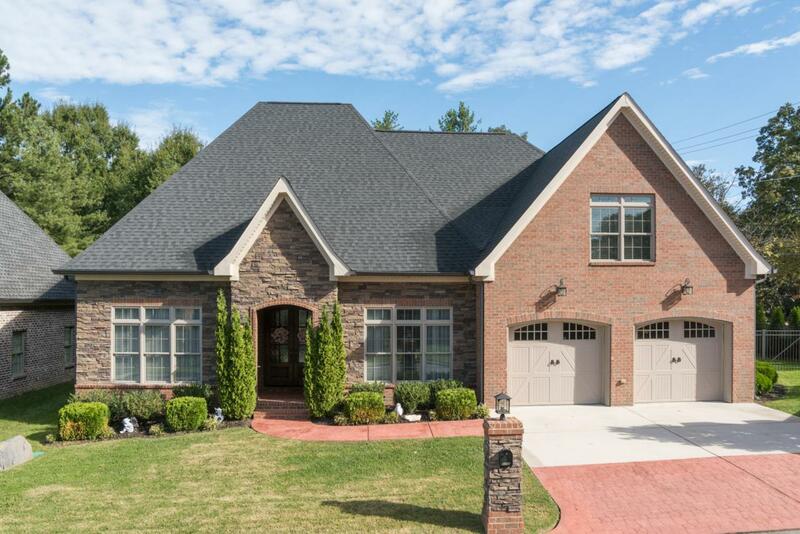 **When you enter the gorgeous solid wood and glass double front doors you will be amazed at the soaring coffered ceiling above the full stone wall and fireplace in the greatroom.The separate dining room has a loveley vaulted ceiling with heavy moldings. The kitchen is sure to amaze with it's incredible size and amount of rich wood cabinetry and gorgeous white quartz countertops and heated tiled floors. There is also a huge L- shaped bar for entertaining, a gas stove, tiled backsplash, under counter lighting, and a great sized pantry. **The main level Master suite has a beautiful wall of windows, double trey ceiling, triple crown molding, a walk in closet with built in shelving, and a separate makeup area with cabinetry and a granite top. The master bath has heated tile floors, separate vanities, a lovely tiled shower with a rain shower, and a jetted tub. There are two additional bedrooms on the main level and a full bath with granite topped wood cabinets and a tub with a custom tiled surround. **The second level of the home has a huge bonus room with gleaming hardwoods and an additional area with a wet bar and cabinitry that could be suited for an in law or teen suite. There is a large bedroom, full bath, and another room for an office or wookout room. * The closet space in this home is is incredible, the laundry room is also well appointed with a laundry sink and cabainetry. **The back yard has fabulous outdoor living space with a large covered porch with gas piped for your grill a separate patio, and a fenced back yard. ***The Seller has lovingly cared for this home, it is move in ready and will be so easy to make it your own! Schedule a showing today and be ready to find yourself right at Home!